I am looking forward to seeing you at the upcoming Student-Led Conferences on Wednesday, March 14, from 4:45-7 PM. Parents: Stop in Room 207 to see what your kids have been learning. They will walk you through some of their learning from the past term. This week in English with 7F1 and 7F2, we learned about one last text structure – problem and solution. Students also selected one of four articles to read and to show how they can identify the main idea of a text. We also role-played a meeting between a journalist and an editor in order to clarify ideas for our non-fiction feature article. Next week, we will finish these interviews, dive into writing, and explore possible sources. As part of this project, students will be invited to contact and interview subject-area experts in the community, like true journalists. 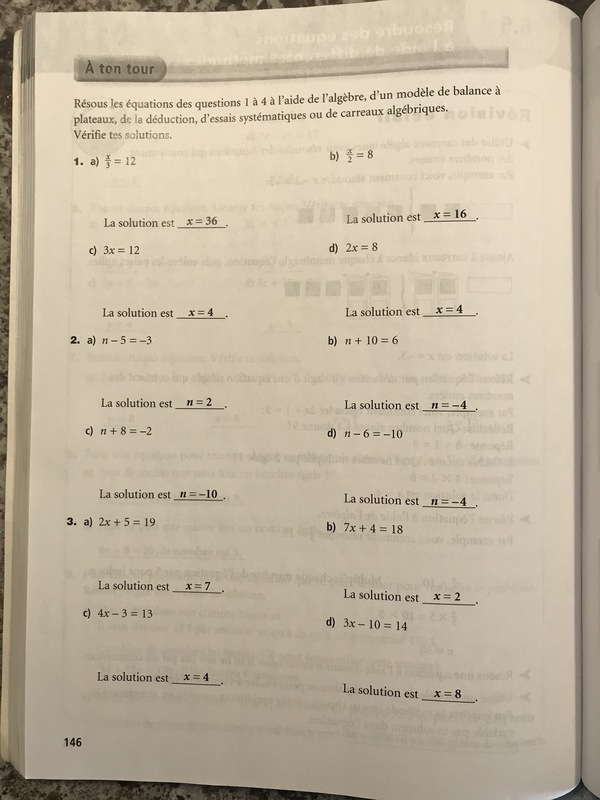 In Mathématiques with 7F2, we reviewed for our upcoming quiz on equations, which will take place on Monday, March 12. As promised to students, below are the review answers. Click each image to enlarge it. In other news, we also began our study of shape and space by reviewing what we know about rectangles. We explored the properties of a parallelogram and will learn how to calculate its area next week. Finally, we began something called “Carrousel mathématique,” where students solve mental math problems and share their strategies with their table group. We have begun to see that the same mental math strategies appear over and over…and that calculations with decimal numbers aren’t as scary as some initially thought! Last, in Français with 7F1, we extended our learning about le passé composé by seeing which verbs conjugated with the verbe auxiliaire être as opposed to avoir. If any parents took French before, you probably remember our friends Dr. & Mrs. Vandertramp! We will use what we are learning to write our own stories this coming week, using photographs taken by M. Bodnar’s technology classes as inspiration. A quick note to end: Congratulations to Ebony and Ryan who delivered wonderful speeches at the divisional Concours d’art oratoire. We are all proud of you! Have a great weekend – and happy reading! 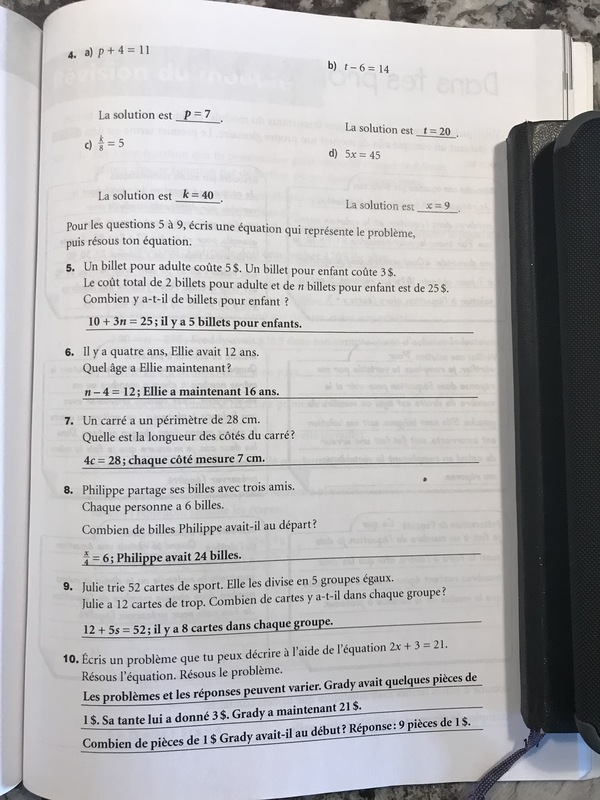 The highlights of the past week included wrapping up our study of equations in Mathématiques with 7F2 and writing a full short story, from beginning to end, in Français with 7F1! A lot of hard work was accomplished in all the academic subjects. In English, with both classes, we practiced identifying the main idea of a non-fiction text by looking at the similarities between the facts listed in the article and those listed in the article’s text features (captions, photos, graphics, headings, etc.). We also identified the cause and effect relationship in a few short texts in order to better understand that structure. We have one last structure to learn about, and it is the one students are most likely to use in their own non-fiction articles: the problem/solution structure. We will likely begin to brainstorm ideas for our non-fiction articles by the end of the week. The end of Term 2 is quickly approaching. Students with missing assignments will soon receive a printout – and an email home – with their missing work. Monday, March 12 will be the deadline to hand in any missing work from Term 2. Thank you to all Knights who continually strive for Excellence and maintain personal and academic Responsibility.